Aside from my boot filling up with rain when a tree branch tucked my pant leg into my boot, it was a great morning picking our food for today’s boxes. I was able to get it all picked, and fertilize many of the summer crops before 1. And it was very nice to leave the field for warm coffee when the rain gave way to a muggy afternoon. due to the rain there were no opportunities to take photos. 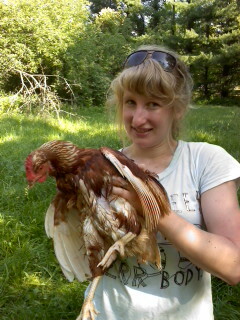 So I’ll indulge you all with a picture of Katherine just after she caught one of our loose hens last week. Speaking of those hens, we do have enough eggs for almost everyone today! Finally, they are getting back to their laying. We’ve still got a couple things to do to make sure the ladies are all as comfortable as can be, but after that, and some more growing up, we’re hoping to go from 6 eggs a day to 6 dozen. Salad Mix: This week we included arugula, baby lettuce, some bronze fennel and arugula flowers. Its a very pretty mix, and the fennel and flowers add a beautiful sweet accent. We hope you enjoy! Small bulb onions: The first of our white bulbing onions, Allissa Craig Exhibition. We picked these from pearl size on up. There should be about a quart per CSA box. Be sure to use them soon or just leave them somewhere that they can dry out, since we couldn’t cure them properly in the rainy weather. Red Russian Kale: A large bunch of gorgeous fringed kale with a purple mid rib. Swiss Chard: Making it’s first appearance in our boxes is this beautiful, supple green -great raw, in salad, or cooked with a little butter. A small bunch of Ruby and Bright Lights Chard. Carrots: 2nd week of our Deep Purple carrots. Crispy, firm, and carrotty! Sage: Delicious fresh herb -great with chicken, in your salad, or in a number of different applications.